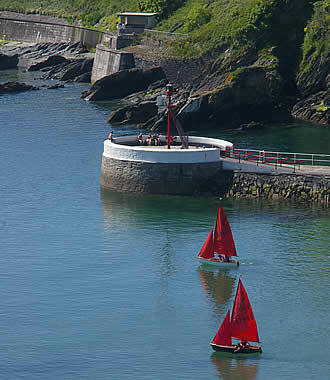 There is much to see and do in Looe itself whether lazing the day away on East Looe's sandy family beach, crabbing from the pier, going on a shark fishing trip or exploring Looe Bay in a glass bottomed boat, wandering through the narrow, picturesque streets browsing in the shops or walking the coast path to the neighbouring fishing village of Polperro to the west or the sandy coves at Seaton and Downderry to the east. Looe is blessed with a good selection of cafes and pubs and many excellent restaurants including the award winning restaurants Trawlers Restaurant on the Quay and Squid Ink Restaurant. Seafaring has been a way of life in Looe for centuries and it is steeped in history with many tales of piracy and smuggling. You can still wander down the ancient streets to the bustling waterfront and watch the fishing boats unload their daily catch at the quay. With two rivers and a tidal harbour, water spanned by an ancient bridge separates East Looe from the quiet West Looe, where The Watermark is situated. The Eden Project - a fascinating day out for all the family. Lands End - an all round family attraction in a unique location with unforgettable scenery. National Trust houses and gardens - Lanhydrock, Cotehele, Anthony House, some of the finest country houses in England, are all within a short drive. The National Aquarium in Plymouth - a good family day out together with the option of a bit of retail therapy in Plymouth's large shopping centre or an exploration of Plymouth's historic Barbican area and the famous Hoe.